Today My Android One: Micromax Camvas A1 got a new system update which in Heading says Android System Update Downloaded and Verified. So you guys might be thinking what update is it? It is surely not Another Android OS update that is Android M.
The update received focuses and upgrades stability, increase security and Few Bug Fix. There were few bugs which made the phone slow and the increase security is good. Well the update is not big in Size, the Update OS sized for 18.0 MB. 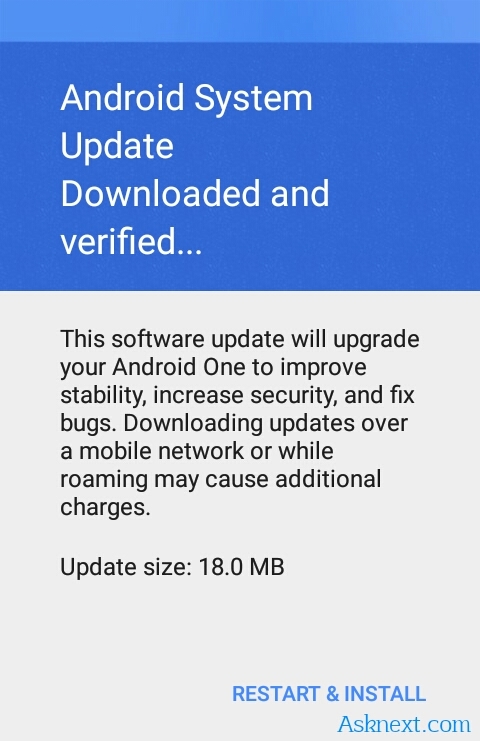 Few precaution you should take before updating are, ensure while updating that you have enough Battery backup like upto 80% and you are updating via Wi-Fi, as the update in itself specifies that downloading updates over a mobile network or while roaming may cause additional charges.